4/33: Huge comfy sofas to kick back on after a long day on the beach. 5/33: St Mac`s Villa from the water. 8/33: Patio doors open to private beach front deck. 9/33: Had too much sun Nap in one of our lounge chairs in your own coconut grove. 10/33: Fully equipped spacious modern kitchen. 12/33: The beach in front of St Mac`s Villa. 14/33: Kick back on the huge comfortable sectional sofa. 16/33: Private beach garden shaded by coconut trees. 22/33: King size bed with beach front views. 31/33: View from the outside deck area. 33/33: Map of West Bay Village. 15 paces from the water, St Mac's Villa is located in West Bay Village an oasis of privately owned homes on West Bay Beach. Just a moments stroll from bars and restaurants. Private and convenient, this location is unbeatable, close to the amenities of West Bay Beach yet secluded and private surrounded by lush tropical gardens. A real gem, this apartment faces directly onto the stunning West Bay Beach. It is extremely spacious and features 1-bed and 1-bath with a large, fully equipped kitchen fitted out with all you could need. There is a large dining area complete with table and chairs and comfortably appointed lounge, all looking directly out onto the private garden and beach. A twin day bed can accommodate a third person in the living area. There is a small patio area with table and chairs and a hammock so you can fully enjoy the outdoors. Large group? St. Mac's Upper has 3 bedrooms and 2 1/2 bathrooms, the Garden Apartment has 1 bedroom and 1 bathroom. Rent the whole house for a total of 5 bedrooms and 4 bathrooms, sleeping up to 10 persons. Enquire for availability & pricing. PLEASE NOTE: This home is only available to rent with arrivals and departures on Saturdays during high season (Christmas through Easter). Bookings made on days other than Saturdays will be rejected. All the staff were very friendly and organized. Fernando was very attentive as well. Great property to stay at. I think it is the best location on West Bay Beach. REPLY: Thank you, we are partial to the location also! We hope you can come back and visit soon. Team is good - I generally find requests need to made more than once but that is not a deal breaker. Property is great overall. West Bay has changed however and the area is growing very rapidly and seemingly with little control. The beach has become very crowded with boats, jet skis etc making swimming less pleasant. And the area by the dock is always full of boats spewing smelly exhaust or blasting loud music over top of the live music coming from Infinity Bay. It just seems much less quiet and laid back which is a shame really, at least for us. Someone should consider managing the swim and dock area a bit better although I'm not sure how that would be accomplished. REPLY: Thank you for your candid review. You are correct, the beach area is changing a bit and there seem to be some growing pains. We are working with the Roatan Marine Park to try and come up with a solution to this. Thanks again, we do hope to have you back. The blender is tired and needs to be updated. One of the plastic utensils is getting weak, the can opener needs to be replaced,and the cold water knob needs to be tightened up. None of this bothered us, but picky people could complain. It gave us a good reason to talk to our neighbors. It's amazing how helpful everyone is. I traded a cold beer (that was in the fridge already) for the use of the can opener, and it was the genesis of great conversations and good times with the upstairs neighbors. REPLY: Thanks, Jim! We will get into the unit pronto to change out the blender and review the kitchen utensils. We always appreciate the help and look forward to seeing you next year. Everything was handled very well from reservations, taxi service, to zip lining excursion. 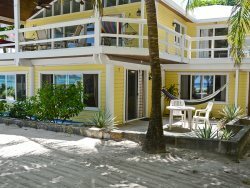 We love staying in roatan and renting one of the houses. We have been there five times and we are planning on coming back again. I don't want to tell everyone about it cause it will get to crowded. The security is excellent and the maids were always accommodating about doing laundry for us. The staff is amazing and extrememly helpful. It was truly a perfect vacation. They set up our transportation to/from the airport, recommended excursions that we did and were fantastic. The place is well maintained and spacious. It was truly a perfect vacation. We will definitely stay here again if visiting Roatan and recommend here for any of our friends as well. Its right on the beach with our own private area where no one else can use -- truly great! Bars and restaurants close by and the sand/water is breathtakingly gorgeous there! Beautiful Place, Romantic Vacaion My wife and I spent 2 wonderful weeks in the Beachfront apartment. Breakfast was usually on the patio with the soothing sounds of the waves in the backround. Lunch was either local fare or something we prepared, but the Burgers at The Blue Parrot in Sandy bay were the best! Sunsets were spent on the dock with new friends, and the best views you have ever seen. The Steaks at the Argentine Grille were well worth the 5 minute walk down the beach. The. nightly entertainment on the beach (including Firedancers!) was always fun. Watching the dive boats get ready first thing in the morning and early morning and late night walks on the beach were always rewarding. Guieremo the security guard was awesome! We also highly recommend the Cayos Cochinos trip,snorkeling with the dolphins at Anthony's Key, and you must pick up some awesome Roatan Rum from the Roatan Rum Factory just a few miles down the road. The Mango Rum is incredible! We keep coming back to this unit for good reason. Steps from the beach, but just far enough away for privacy. Discount available for reservations of 3 weeks or more. Maid Service once a week included on 7-night rental. Air Conditioning is available for $15/day (apartment has 1 large a/c unit in the living area).